Tomorrow is the National Day of the People's Republic of China. And like in much of China, Chinese flags are plentiful in Mudanjiang, including at Culture Square. One flag on an electric scooter parked outside of People's Park especially caught my attention today. I have seen small Chinese flags flying on scooters. 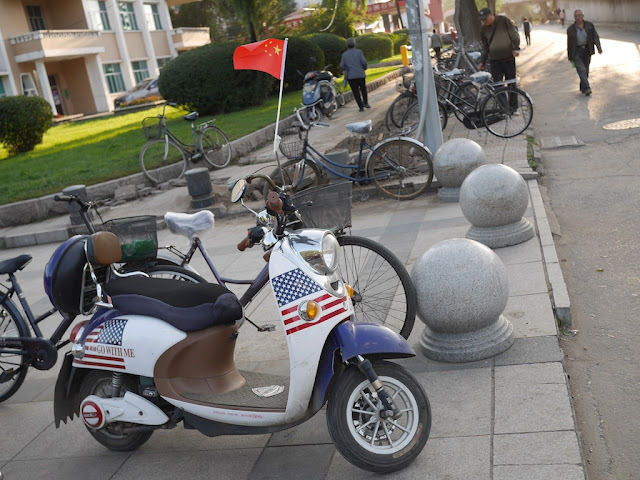 I have seen American flag designs on scooters elsewhere in China. But I don't recall having ever seen them together before. I don't know if the flag was added for tomorrow's holiday or is a regular feature. 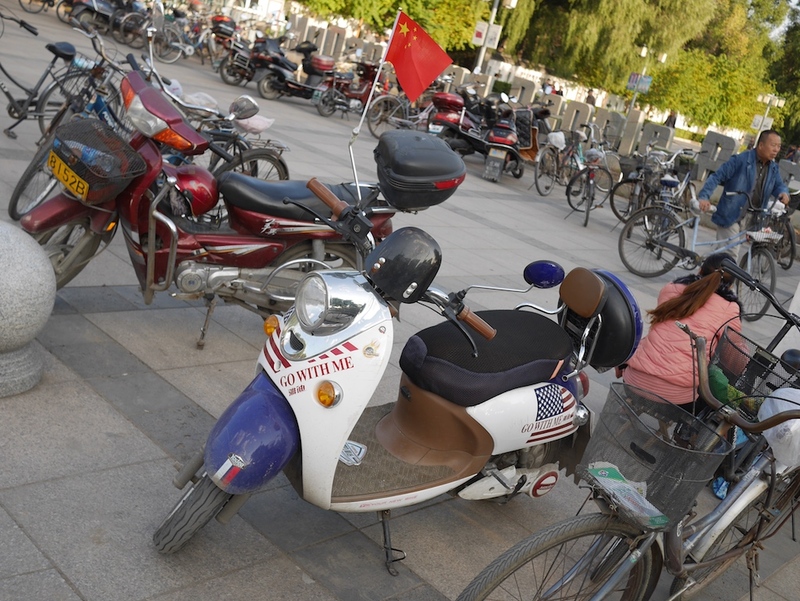 Given the clear American theme, I wondered if the owner of the scooter added the Chinese flag to avoid questions about their patriotism. Below are two more photos showing the fuller design on the scooter. 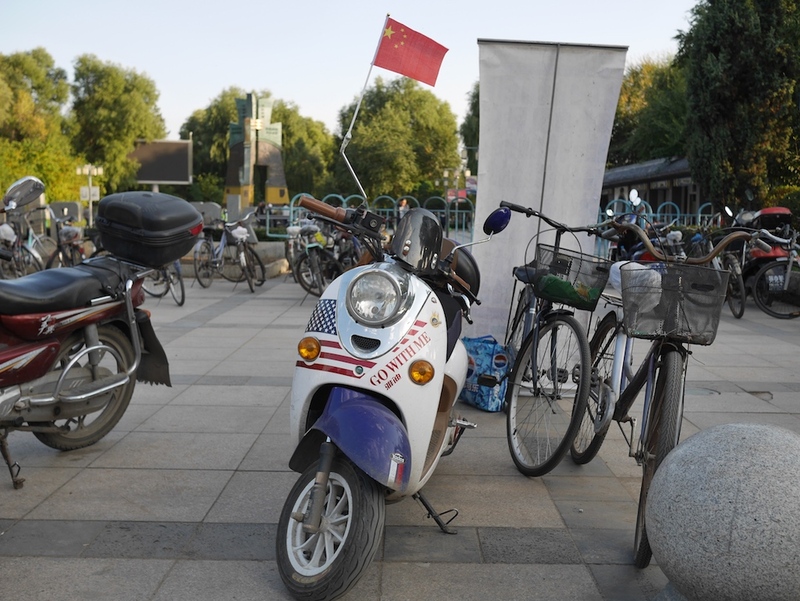 For me, the mix of flags is a reminder that national symbols can be displayed for different reasons. 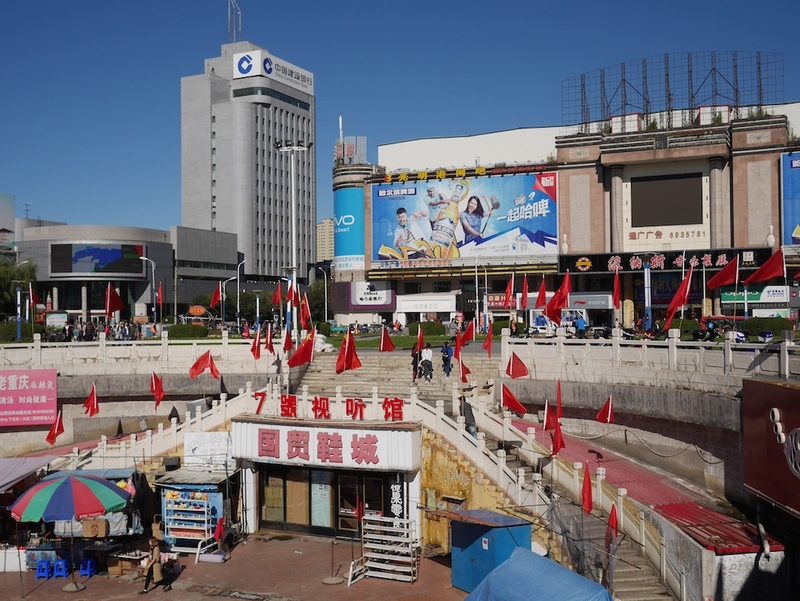 Yesterday at the central Culture Square (文化广场) in Mudanjiang, I was reminded that the National Day of the People's Republic of China is approaching. Curiously, almost all of the Chinese and plain red flags surrounding the main entrance to the underground Guomao Shopping Center (国贸商城) were gone today. Only a few on top of its main sign (not seen in the above photo) remained. National Day will begin October 1 regardless though. And some cities not very far away will soon see hotel rates quadrupling in the holiday spirit. UPDATE: An explanation for the disappearing (and later reappearing) flags here. Especially for those who feel they need a break from news and analysis about the presidential debate between Hillary Clinton and Donald Trump in the U.S., here is a photo of another "debate" which recently occurred. A man on the left side of the photo was pulled away while the man in the center of the photo wearing a white shirt did his best to have the last word. I noticed the heated dispute at its end and have no idea what caused it. 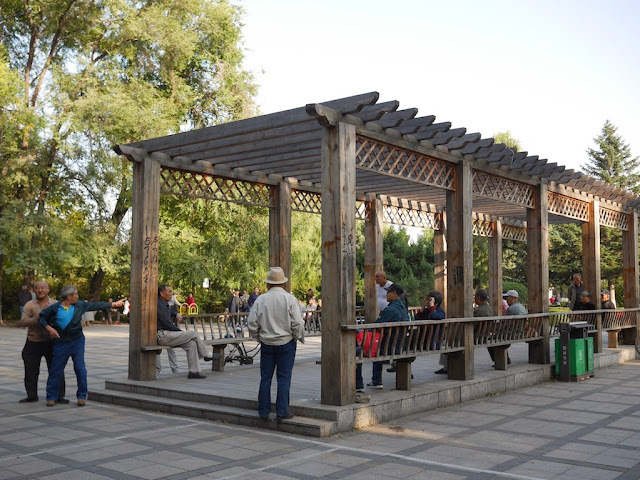 I doubt it related to U.S. presidential politics though, since the setting was a park, almost all of which was more peaceful, rather far away from the U.S.
Mudanjiang in China's Heilongjiang province is also far away from the two cities featured in many recent posts — Macau and Zhuhai. More about Mudanjiang and other locations in Northeast China, otherwise known as Dongbei, later. And more about Macau, Zhuhai, and other topics as well. Hopefully that won't anger anybody. 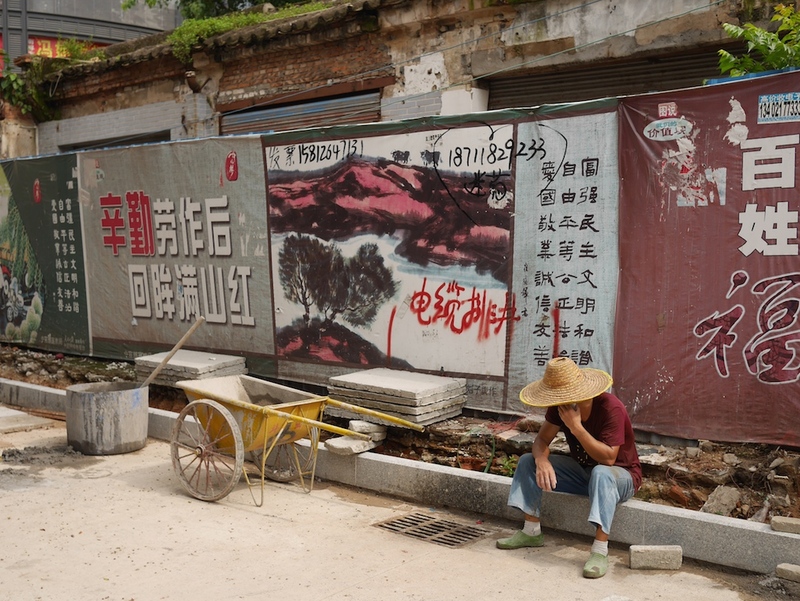 Although anti-Japanese attitudes are common in China, many Chinese travel to Japan every year for tourism or business. Some will even go there during a Victory Over Japan holiday. Chinese pingpong champion Wang Nan says her husband was right to leave the faucet running in a Japanese hotel to waste water as revenge over Japan for invading China 85 years ago. “It was really satisfying to keep the water running in a Japanese hotel,” the husband gleefully posted on the Chinese microblog Weibo. In response, Adam Minter went with "Revenge just isn't what it used to be ...". 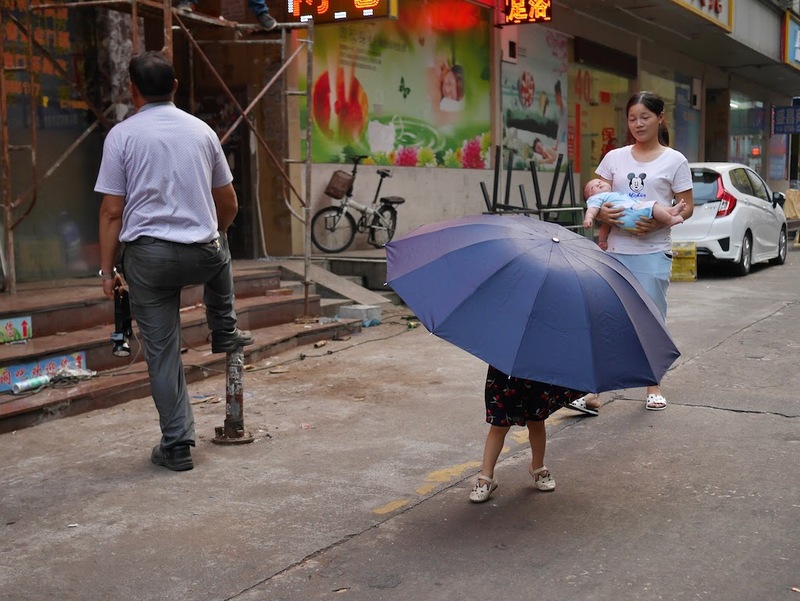 Read the full article on The Asahi Shimbun for the reactions that show not everybody in China was impressed with this act of water either. No word yet if the man also left the mini fridge door open. The tall buildings next to the road can be seen in the previous post's photo. The buildings much farther away in the background are across the border in Zhuhai and near where I took the earlier photo. The next photos I share taken from the area here and before won't feature the two neighboring cities, but instead some new bridges and artificial islands. 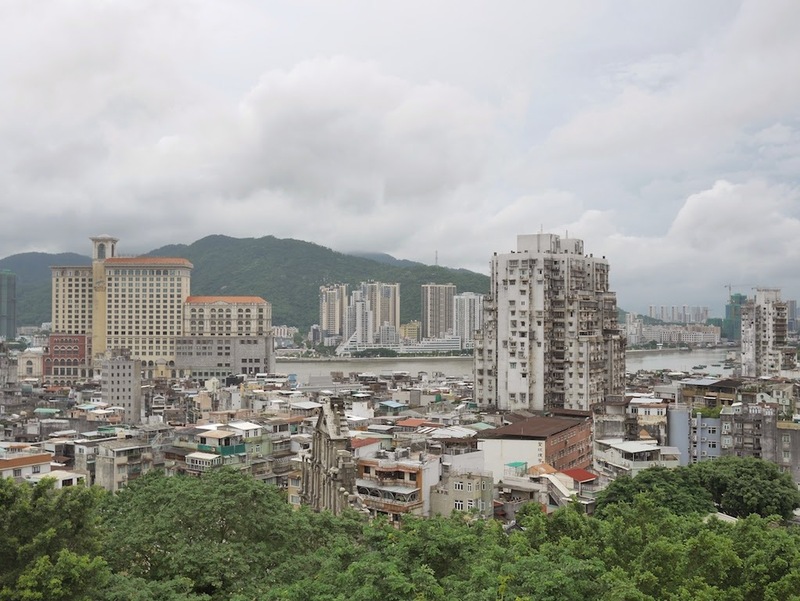 One notable aspect of the photo are the cranes towering over the under-construction building on the far right in Zhuhai and the buildings with greenish scaffolding left of center in Macau. The change in Macau's skyline is evident when comparing this photo to a couple of photos taken from a similar vantage point shared in a post from four years ago about the border between Zhuhai and Macau. There is another notable change, though it is more difficult to see in the photo. 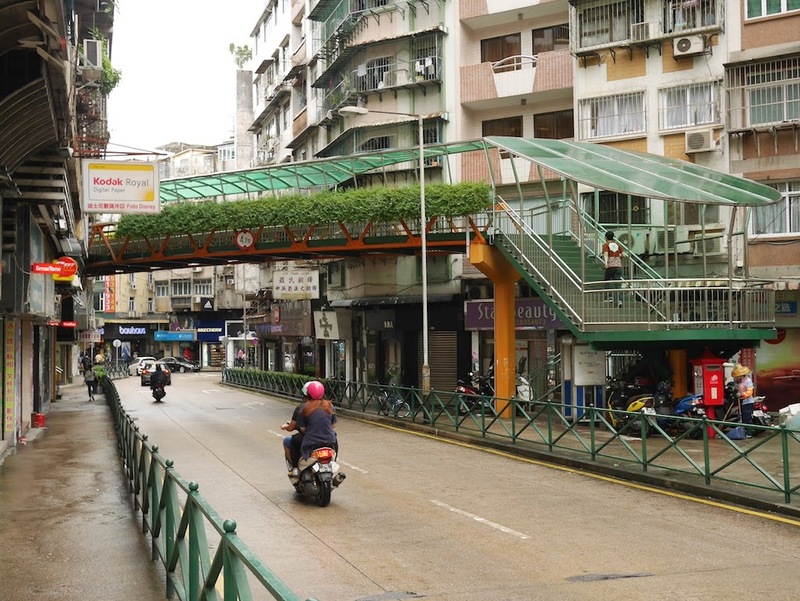 Near Macau and running roughly parallel to its shoreline, there is now a land bridge. It doesn't look like much, but it is an important part of an extensive series of bridges, tunnels, and artificial islands under construction which will connect Zhuhai and Macau to Hong Kong across the Pearl River Estuary. 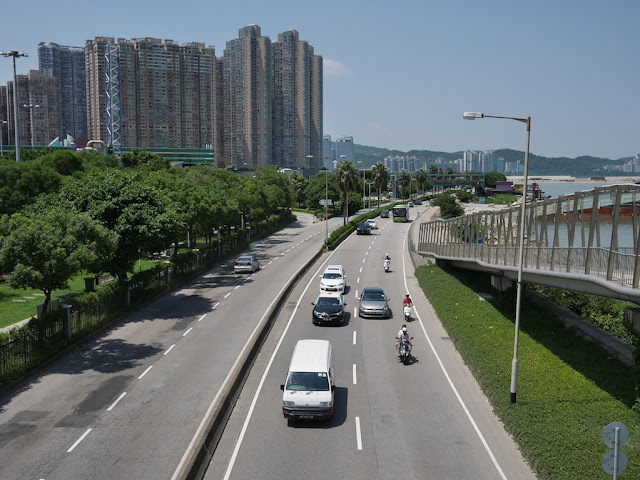 More about that massive, expensive, and delayed project and how it has changed views from both Zhuhai and Macau later. For readers relatively new to this blog, I want to highlight some posts from previous years about the border between Zhuhai, a city in Guangdong province, and Macau, one of China's two Special Administrative Regions. Posts covered topics including mainland Chinese who visit Zhuhai but don't have the special permit they need to enter Macau, the fences and walls separating the cities, a comparison of waterside walkways with views (which have since significantly changed) of the other city, and the grey market (which appears to have since evolved as well) that flows across the border. 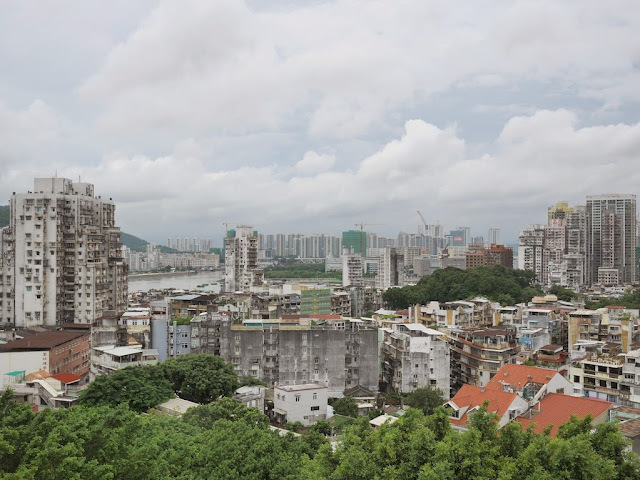 To add to the series of posts, below are several photos taken from Macau's historical Monte Fort, in order facing approximately northwest, west, and southwest. 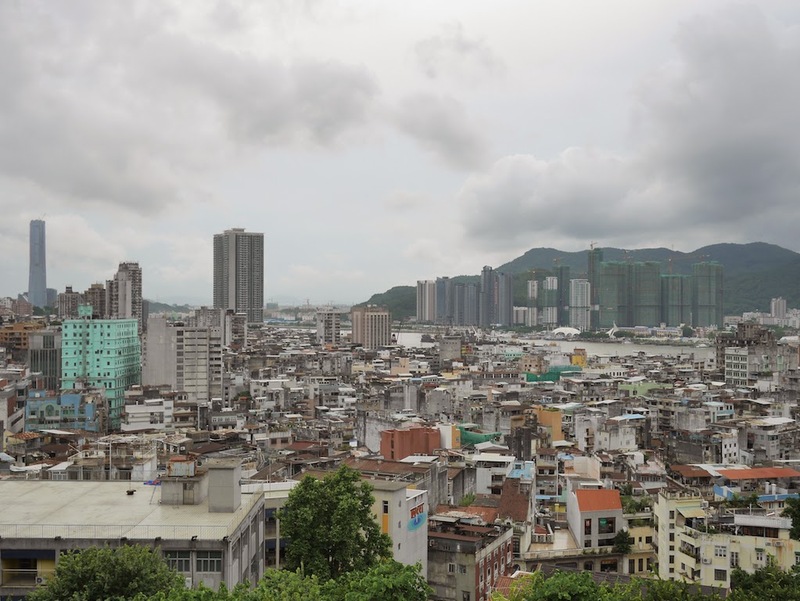 They capture Macau in the foreground and Zhuhai towards the background. Water separates the cities in the photos, though it is isn't visible in all places. 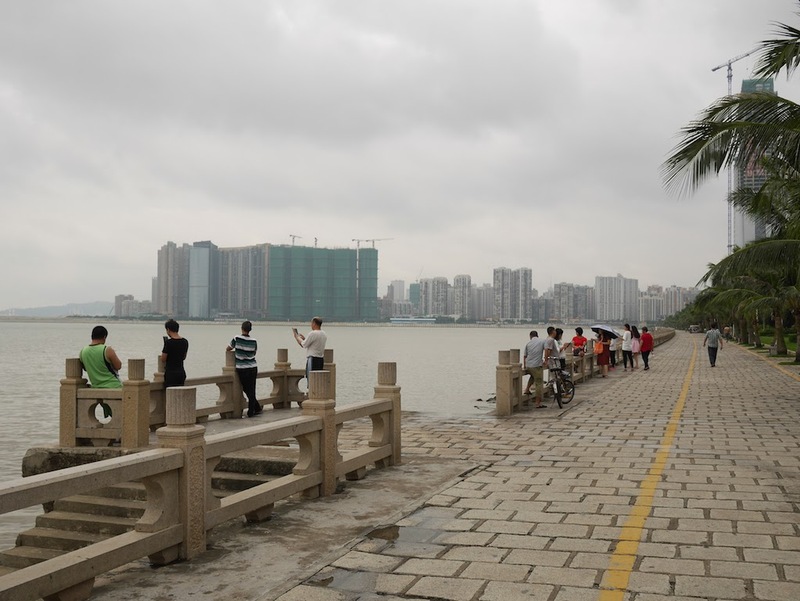 For example, the tall, slender building on the far left side of the last photo is in Zhuhai (more about it another day). When I am in the heart of Macau, Zhuhai often feels like it is a world away. Views such as these remind me of how close it remains, as long as I have my passport and Chinese visa. Tomorrow is the Mid-Autumn Festival. So here are photos of holiday lanterns, sans dinosaurs or Hello Kitty, from two familiar places for this blog in Macau. 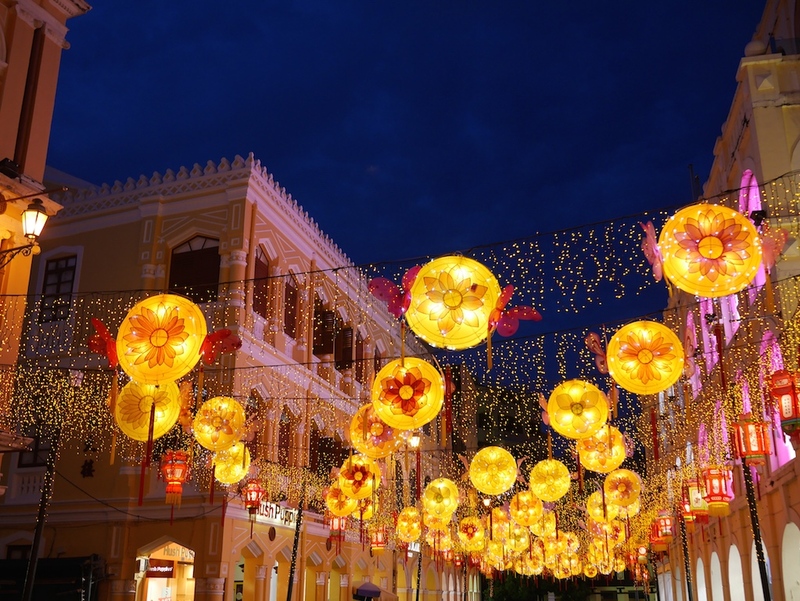 And that is it for Mid-Autumn Festival photos from Macau this year (I think). I definitely can't take any more, since I am now in another place far away. 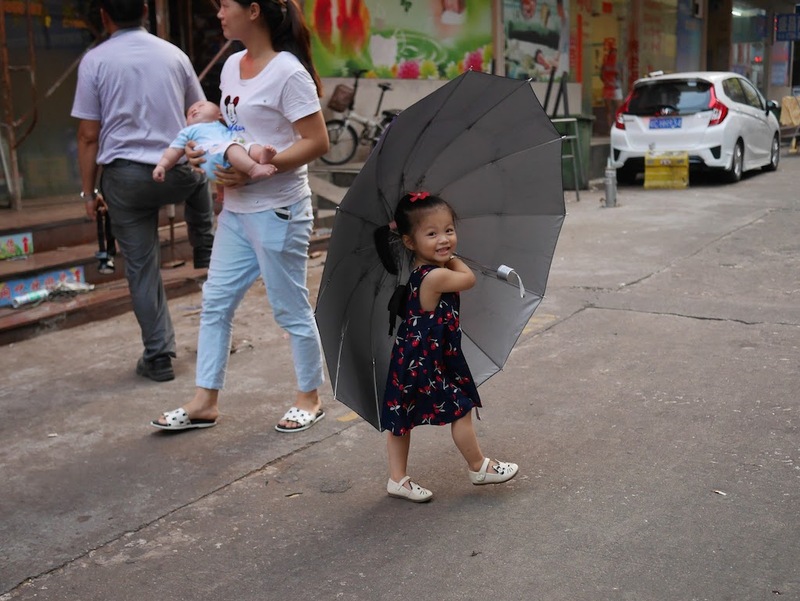 One day in Zhuhai I saw a large umbrella approaching, and I wondered what was under it. Soon, the answer was revealed. 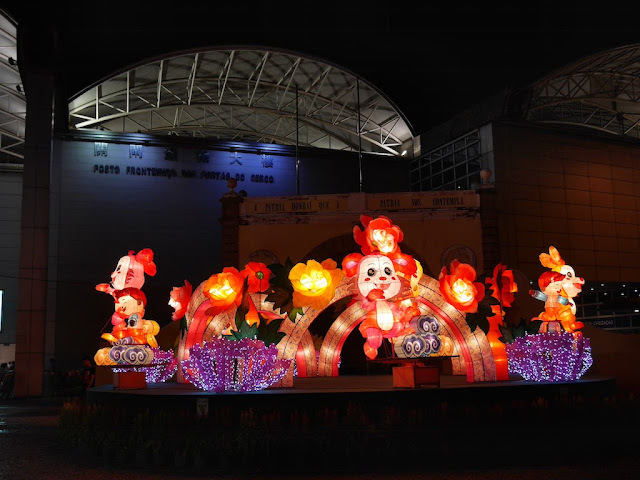 Hello Kitty mooncakes aren't the only example of the Mid-Autumn Festival mixing with other themes in Macau. These holiday lanterns and dinosaur currently stand in front of the Macau Science Center, which has a temporary "Living Dinosaurs" exhibition. 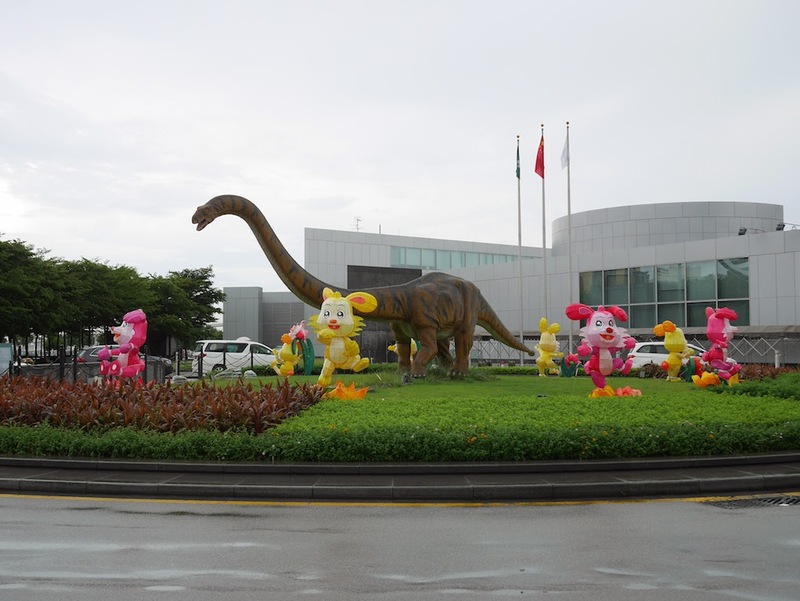 Similar lanterns are on display elsewhere in Macau, but I haven't seen others with a dinosaur. Maybe I will get to see a dinosaur lantern somewhere else soon. 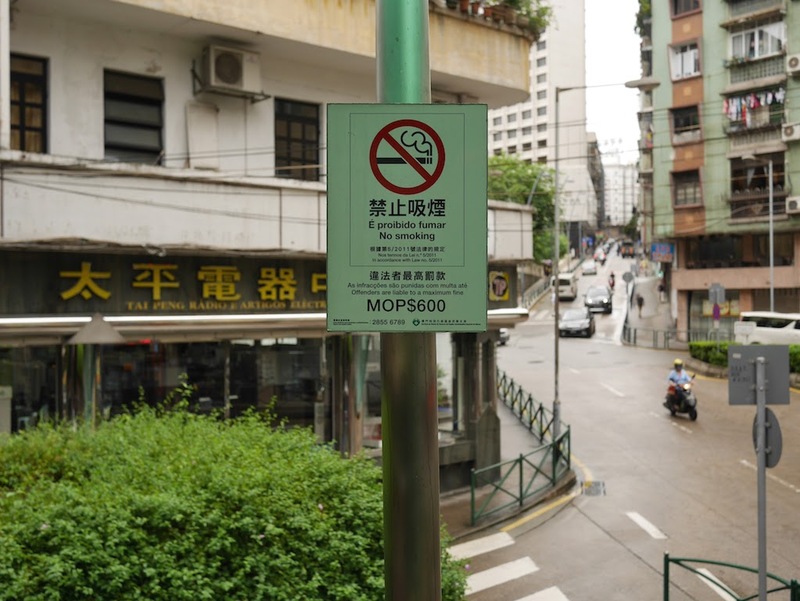 A few years ago I wrote about new regulations requiring non-smoking areas in Macau's many casinos. 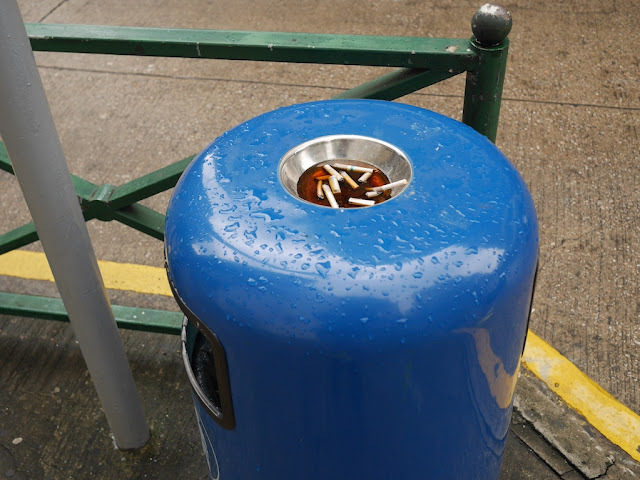 Casinos aren't the only places, though, where smoking is regulated, and government "no smoking" signs are easy to find these days. The above sign especially caught my eye due to its location. Even open-air pedestrian bridges can be smoke free in Macau. After taking the above photograph I noticed someone walking towards me. I soon realized why. They didn't care about me but instead cared about what was next to me. Plenty of people in Macau still smoke. 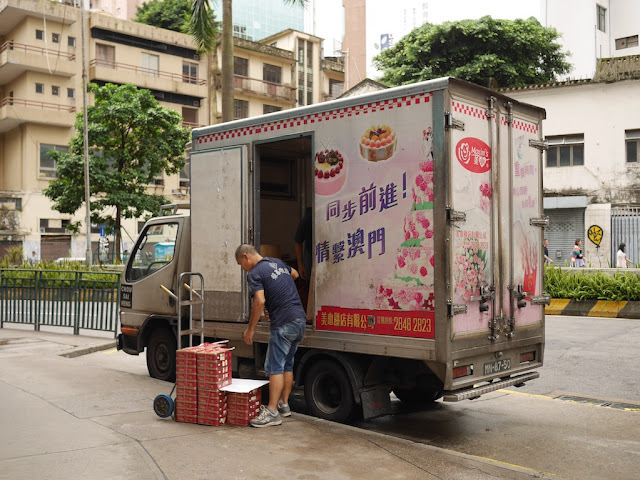 Today I saw more signs in Macau of the upcoming Mid-Autumn Festival holiday, including this truck delivering Maxim's mooncakes. 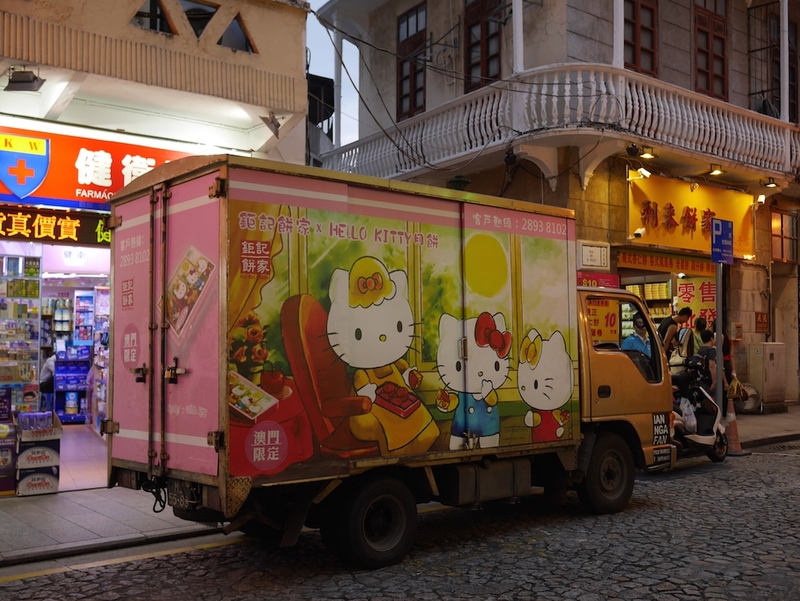 Unlike the mooncakes for dogs and cats I saw advertised elsewhere in Macau, these appeared to be for humans. Later in the day, I saw a Koi Kei bakery truck with a less traditional design than I have seen before. The truck's design featured mooncakes. Again, they are presumably for humans, but they do have a popular cat theme. Hello Kitty mooncakes represent a fusion of sorts between Chinese and Japanese cultures. I will soon share another mooncake fusion cooked in a place far away from Macau. 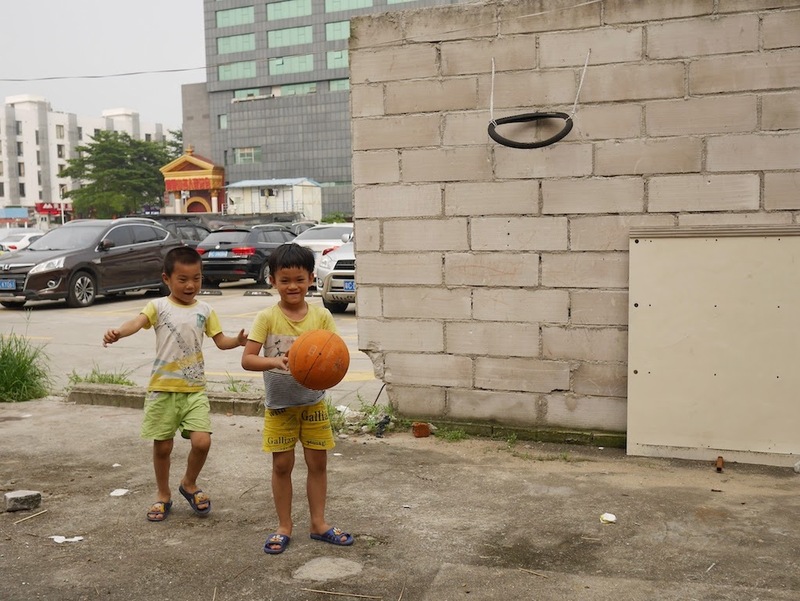 Just a few minutes walk from where I saw a late night game on Gaosha Middle Street in Zhuhai, I saw more kids playing with a ball today. In this case, I wouldn't call it "Gongbei-ball". "Basketball" works just fine here. 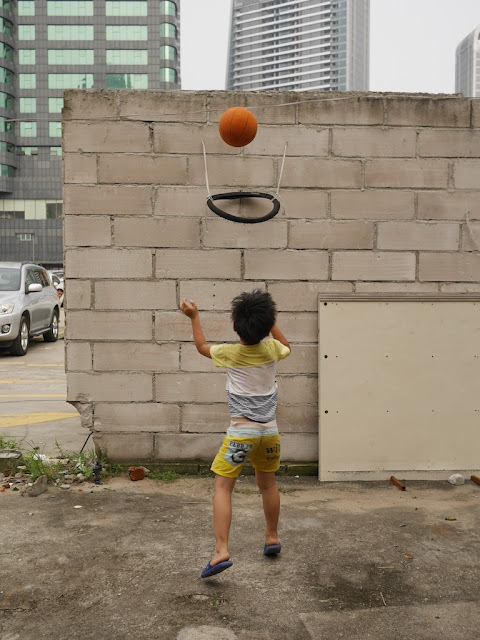 Unlike the Gongbei-ball ball, this ball appeared to store bought like another I recently saw. But a bit of creativity was required for the basketball hoop which was made using rope and a bicycle tire. One of the boys took a few shots while I photographed. He made almost all of the shots and the hoop served its purpose well, just like the Gongbei-ball ball. 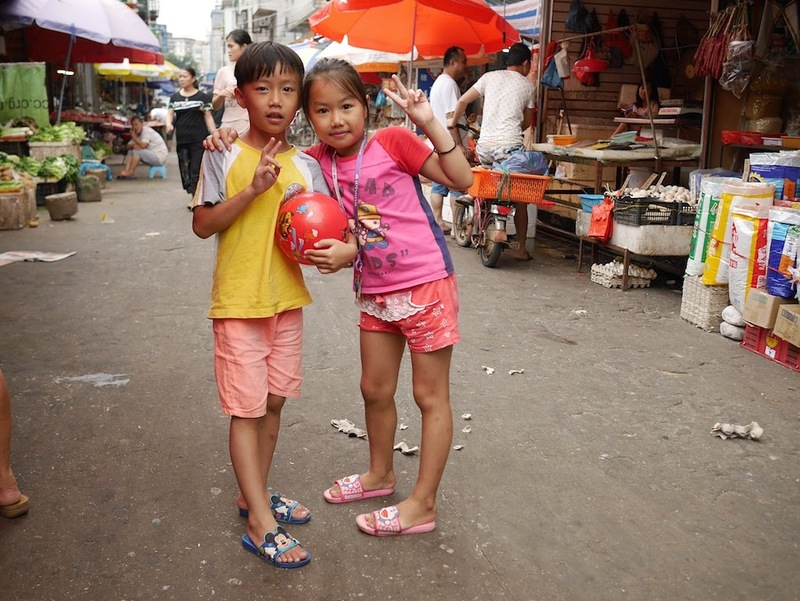 They asked me to take their photo . . .
Like the boys I saw elsewhere in Gongbei, Zhuhai, the boy and girl had a ball, though it appeared to be store bought. I don't know if they were about to play a game of Gongbei-ball. Like Gaosha Middle Street, this road has an alley feel to it, and there is not universal agreement on its name. Online maps identify it as either Lian'an East Street (联安东街) or Lian'an Alley. Posted signs there are divided on the issue as well. 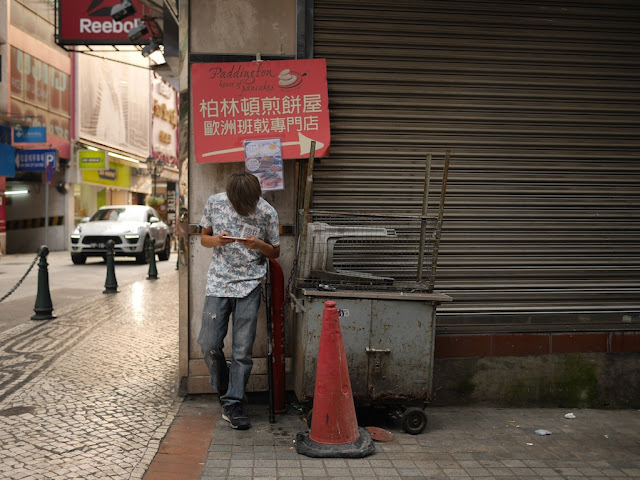 After taking photos of conflicting signs on different sides of the road almost directly opposite each another, I noticed a man standing in front of a shop watching me. So I asked him the name of the road. He looked down the road for a long five seconds. 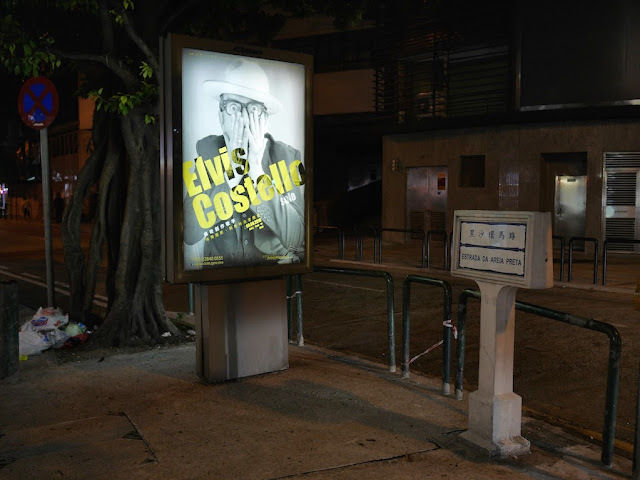 Just as I began to wonder whether he would answer, he said "Lian'an East Street". So I will go with that.